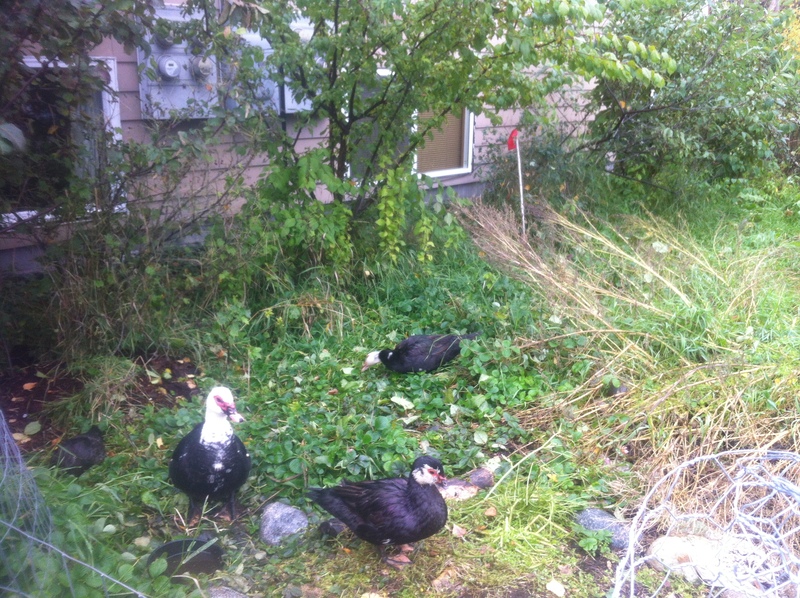 I have had muscovy ducks in my backyard for about 4 years now…at first penned up with the chickens, and then penned up in the back of the yard, where only the raspberries and weedy grass grew. Throughout most of the summer I didn’t notice too much change due to the ducks – extra poop everywhere, and some trampled areas where they liked to bed down for the day (they liked open ground, so my newly planted asparagus bed, which for some reason was not well mulched, suffered. ), and some holes in the woodchips where they stuck their bills in and sifted for protein snacks. I fed them fairly daily with barley grain as well – about a quart for 4 adults and a baby. As fall rolled around, and I started realizing how well they have been finding their own meals (and since the wild seeds are in profusion) I sometimes go a few days without feeding. If I go too long they figure out how to escape the yard, but they are doing a much better job of mowing down some of the plants I want them to now (mainly quackgrass). I have wanted to eradicate grass from my plantings for years, but now I see its value as forage…and of course this foraging pressure will cut down its dominance! It seems their preferences have been, sorta in this order (at least of what is available in the space): insects (including worms, slugs, flies, etc etc), berries within reach, red clover, tender grass, kale, comfrey, (probably chickweed and dandelions about here), turnip greens, tougher grass, turnip stems, mature lambs quarters seeds, chives, horseradish leaves, valerian leaves. They have not seemed to damage in any way strawberry plants, trees and shrubs and raspberry canes, russian tarragon, yellow toadflax, lupine, or motherwort. They have smooshed, to varying degrees, some small, young transplants of asparagus, native artemisia, french sorrel (they probably ate this too), lovage (though this isn’t in that bad of shape, just walked on a bit), and haskap. All of this could have been prevented with a low fence around the plants, but so far the area and number of plants affected is small. I have great hopes that this arrangement will lead to healthier ducks, fewer pest insects (especially hopeful on slugs, currant worms and leaf rollers), naturally mowed grass for a ‘cleaner’ look to the yard – for those who care, low effort fertilization of the fruit trees, and less food expenses for the ducks. For more thoughts on the subject, I found 10 reasons for and against muscovies in the back yard in this great post, which mostly mirrors my experience!